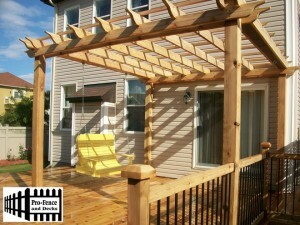 Pro-Fence and Decks Inc. Pergolas Ottawa Installer/builder/contractor Ottawa. Pergolas are becoming very popular in Ottawa. They are unique addition to any back yard because of their open design that is visually appealing. Pergolas add comfort, style and architecture character to your home. There is so much variety and materials such as Wood, PVC and Composite. We can help you design and build a custom Pergola to match your existing deck or make it unique to fit your style of backyard. If you are considering installing a Pergola on your property consult our Pergola specialist here at Pro-fence and Decks Inc. We would more than happy to assist you with a free estimate and help you make the right decision. Pro-Fence and Decks Inc. is a family owned and operated company. We specialize in Residential/Commercial Fencing, Decking and Pergolas in the Ottawa Region. Continuously we strive to build a name and reputation as one of the most innovative Design Builds firms in the city.